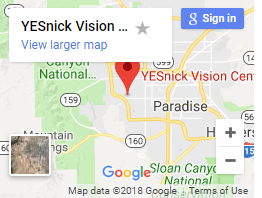 YESnick Vision Center is recognized and recommended as the leading optometry practice in Las Vegas by many satisfied local and worldwide patients. 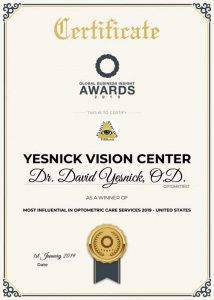 As one of the very few optometrists in the region qualified to treat low vision, Dr. David YESnick O.D., provides expert, extraordinary eye care services for the most challenging visual and medical eye conditions. In acknowledgment of their superior optometric care, Health Plan of Nevada (HPN) and Sierra Health and Life recently authorized YESnick Vision Center with exclusive rights to provide vision care and ocular treatment with coverage from their insurance plans.  With almost two decades of professional experience and first-rate credentials, patients can depend upon the high accuracy of Dr. David Yesnick’s diagnoses and treatments. Located conveniently to serve the communities of Summerlin and Spring Valley, his Las Vegas clinic is furnished with the latest progressive technology and advanced optometric equipment. A total range of eye care services are offered, from a quality collection of trendy designer frames to comprehensive eye exams and ocular disease management. The acceptance of coverage by Health Plan of Nevada (HPN) and Sierra Health and Life further validates Dr. Yesnick’s unique qualifications as the premier eye care provider in Las Vegas. Up until now, only massive corporations, such as Sears Optical and Lenscrafters, were permitted to participate in these insurance plans. “My job and passion is to help people get better. I work with my patients, helping them reorient their lives around what matters to them – and I am always thrilled to see them recover their visual independence!” says Dr. David Yesnick. A warm, personalized approach to eye care is the motto shared by his whole team. With a strong commitment to staying perfectly on schedule, patients report an average wait time of only 7 minutes! Visual acuity and ocular health are examined thoroughly during the first visit, with no need to return for multiple repeat visits. With exceptional eye care, friendly service and ultimate convenience, patients from all over America and the globe are attracted to this practice. Altogether, the benefits of scheduling an appointment at YESnick Vision Center are as clear as 20/20 vision. Patients are encouraged to contact YESnick Vision Center for an appointment, now covered by Health Plan of Nevada (HPN) and Sierra Health and Life, in addition to many other insurance plans.